When I bought the Taste of Home Baking Book at a book sale, my husband didn’t even complain about another cookbook – instead he started choosing recipes for me to make. This thick, over 500 page book, from 2007, is chock full of all kinds of baking recipes. The book has 725 recipes and 675 color photos, many of them showing step-by-step methods. The book is generously filled with baking tips, pointers and solutions for common baking problems, many of them right where you need them, in the right chapter and next to a recipe that uses those steps. I really like the indexes, which are alphabetical, then by subject, and then for all the reference and tips ideas. It is sooo much easier to find what you’re looking for with this kind of indexing. 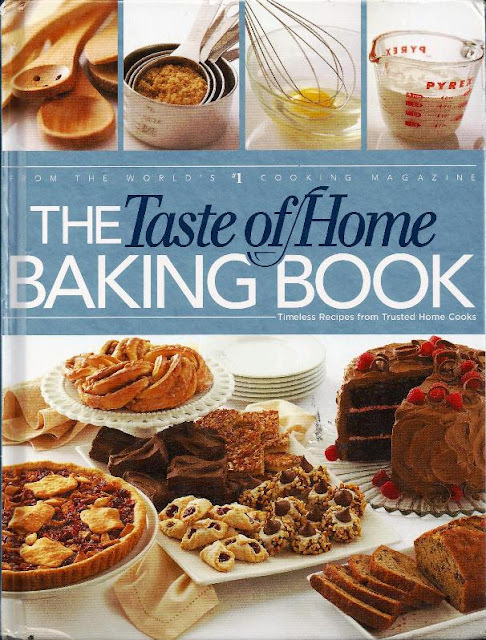 Myrna bought one of these volumes too, and we had a lot of fun baking 4 weeks’ worth of recipes from this book. We have cookies and bars, yeast breads and buns, quick breads, and cakes to share with you. There are pie recipes too, as well as cheesecakes, desserts, muffins, biscuits and scones, and holiday baking – we may have to come back another time to get to those last categories. And yes, I made those scrumptious brownies from the front cover! I love cookbooks, even older ones, and the Taste of Home series always has good recipes.. I'll look for your posts.